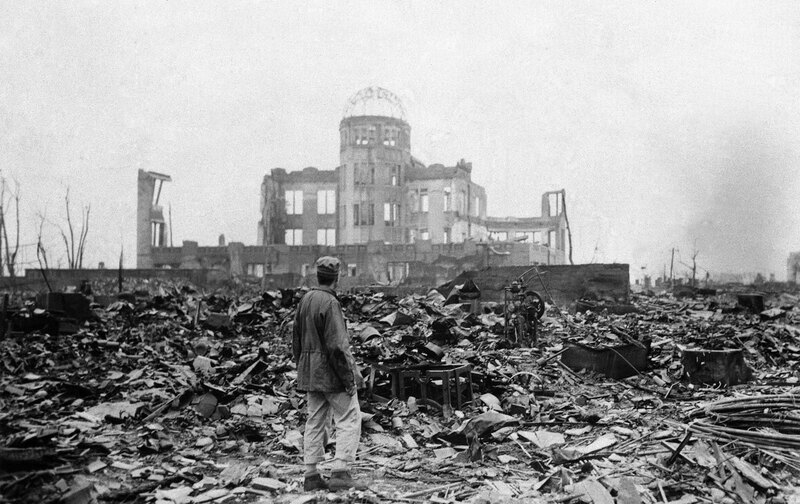 Here we are, 70 years after the nuclear obliteration of Hiroshima and Nagasaki, and I’m wondering if we’ve come even one step closer to a moral reckoning with our status as the world’s only country to use atomic weapons to slaughter human beings. Will an American president ever offer a formal apology? Will our country ever regret the dropping of “Little Boy” and “Fat Man,” those two bombs that burned hotter than the sun? Will it absorb the way they instantly vaporized thousands of victims, incinerated tens of thousands more, and created unimaginably powerful shockwaves and firestorms that ravaged everything for miles beyond ground zero? Will it finally come to grips with the “black rain” that spread radiation and killed even more people — slowly and painfully — leading in the end to a death toll for the two cities conservatively estimated at more than 250,000? It turns out, however, that Bush’s version of American remorselessness isn’t quite enough. After all, Americans prefer to view their country as peace-loving, despite having been at war constantly since 1941. This means they need more than denials and non-apologies. They need persuasive stories and explanations (however full of distortions and omissions). The tale developed to justify the bombings that led to a world in which the threat of human extinction has been a daily reality may be the most successful legitimizing narrative in our history. Seventy years later, it’s still deeply embedded in public memory and school textbooks, despite an ever-growing pile of evidence that contradicts it. Perhaps it’s time, so many decades into the age of apocalyptic peril, to review the American apologia for nuclear weapons — the argument in their defense — that ensured we would never have to say we’re sorry. Over the years, the ever-increasing number of lives those two A-bombs “saved” became a kind of sacred numerology. By 1991, for instance, President George HW Bush, praising Truman for his “tough, calculating decision,” claimed that those bombs had “spared millions of American lives.” By then, an atomic massacre had long been transformed into a mercy killing that prevented far greater suffering and slaughter. Truman went to his grave insisting that he never had a single regret or a moment’s doubt about his decision. Certainly, in the key weeks leading up to August 6, 1945, the record offers no evidence that he gave serious consideration to any alternative. Truman did not seriously consult with military commanders who had objections to using the bomb. He did, however, ask a panel of military experts to offer an estimate of how many Americans might be killed if the United States launched the two major invasions of the Japanese home islands scheduled for November 1, 1945 and March 1, 1946. Their figure: 40,000 — far below the half-million he would cite after the war. Even this estimate was based on the dubious assumption that Japan could continue to feed, fuel, and arm its troops with the US in almost complete control of the seas and skies. Keep in mind, however, that part of Truman’s motivation for dropping those bombs involved not the defeated Japanese, but the ascending Soviet Union. With the USSR pledged to enter the war against Japan on August 8, 1945 (which it did), Truman worried that even briefly prolonging hostilities might allow the Soviets to claim a greater stake in East Asia. He and Secretary of State James Byrnes believed that a graphic demonstration of the power of the new bomb, then only in the possession of the United States, might also make that Communist power more “manageable” in Europe. The Smithsonian exhibit would have suggested that Cold War planning and posturing began in the concluding moments of World War II and that one legacy of Hiroshima would be the massive nuclear arms race of the decades to come. In addition to displaying American artifacts like the Enola Gay, Smithsonian curators wanted to show some heartrending objects from the nuclear destruction of Hiroshima, including a schoolgirl’s burnt lunchbox, a watch dial frozen at the instant of the bomb’s explosion, a fused rosary, and photographs of the dead and dying. It would have been hard to look at these items beside that plane’s giant fuselage without feeling some sympathy for the victims of the blast. In the two decades since, we haven’t come closer to a genuine public examination of history’s only nuclear attack or to finding any major fault with how we waged what Studs Terkel famously dubbed “the Good War.” He used that term as the title for his classic 1984 oral history of World War II and included those quotation marks quite purposely to highlight the irony of such thinking about a war in which an estimated 60 million people died. In the years since, the term has become an American cliché, but the quotation marks have disappeared along with any hint of skepticism about our motives and conduct in those years. The ABC Radio Network thought Hersey’s book so important that it hired four actors to read it in full on the air, reaching an even wider audience. Can you imagine a large American media company today devoting any significant air time to a work that engendered empathy for the victims of our twenty-first century wars? Or can you think of a recent popular book that prods us to consider the “material and spiritual evil” that came from our own participation in World War II? I can’t. In fact, in the first years after that war, as Paul Boyer showed in his superb book By the Bomb’s Early Light, some of America’s triumphalism faded as fears grew that the very existence of nuclear weapons might leave the country newly vulnerable. After all, someday another power, possibly the Soviet Union, might use the new form of warfare against its creators, producing an American apocalypse that could never be seen as redemptive or merciful. In the post-Cold War decades, however, those fears have again faded (unreasonably so since even a South Asian nuclear exchange between Pakistan and India could throw the whole planet into a version of nuclear winter). Instead, the “Good War” has once again been embraced as unambiguously righteous. Consider, for example, the most recent book about World War II to hit it big, Laura Hillenbrand’s Unbroken: A World War II Story of Survival, Resilience, and Redemption. Published in 2010, it remained on the New York Times best-seller list in hardcover for almost four years and has sold millions of copies. In its reach, it may even surpass Tom Brokaw’s 1998 book, The Greatest Generation. A Hollywood adaptation of Unbroken appeared last Christmas. The book is decidedly a page-turner, but its focus on a single American’s punishing ordeal and amazing recovery inhibits almost any impulse to move beyond the platitudes of nationalistic triumphalism and self-absorption or consider (among other things) the racism that so dramatically shaped American combat in the Pacific. That, at least, is the impression you get combing through some of the astonishing 25,000 customer reviews Unbroken has received on Amazon. “My respect for WWII veterans has soared,” a typical reviewer writes. “Thank you Laura Hillenbrand for loving our men at war,” writes another. It is “difficult to read of the inhumanity of the treatment of the courageous men serving our country.” And so on. The film version of Unbroken evokes even less empathy for the Japanese experience of nuclear war, which brings to mind something a student told my graduate seminar last spring. He teaches high school social studies and when he talked with colleagues about the readings we were doing on Hiroshima, three of them responded with some version of the following: “You know, I used to think we were wrong to use nukes on Japan, but since I saw Unbroken I’ve started to think it was necessary.” We are, that is, still in the territory first plowed by Truman in that speech seven decades ago.